It's okay, you can tell me the truth. You've been waiting with bated breath to find out how my son's first day at school went, right? He sported his new super-short haircut (two days ago, it was a good 6 inches longer), awoke at 5:30 a.m. too excited to get back to sleep (...meaning I, too, have been awake since then), and has a male teacher for the first time. Said teacher has already sent me an e-mail about classroom volunteering. I love 'em when they're new to the school—they're so bright-eyed and bushy-tailed and not burned out, and they're so into communicating with the parents. Best of all, he didn't assign any homework today. Whoo-hoo! 17A. [Arborists] are TREE EXPERTS. 24A. [Capitalism] clues FREE ENTERPRISE. 40A. I like the opening "DON'T" in DON'T SEE EYE TO EYE, or [Disagree]. An entry like NOT SEE EYE TO EYE would feel drier to me. 50A. The [Tuneful Ford] is TENNESSEE ERNIE Ford. My son's teacher's first name is Ernie. I'm not wild about the overall fill, which feels hamstrung by the inclusion of six theme entries and perhaps by the pile-ups of consecutive Es. There are so many 3-letter answers, and plenty of abbreviations (A MAJ., BBQ, ENS., EDT, CRT'S, MSGR., DR'S, ESC, WWW, DMZ'S, EST'D, ATT., AES, NYT, STES...that's 15 abbreviations). I'm too sleepy to find more to talk about right now, so I'll see you in the a.m.
45A. [Cheech Marin parody of a Bruce Springsteen song] and BORN IN EAST L.A. While I wasn't able to track down a KARAOKE track [Sing-along format] for the latter, here's one for the Boss's classic. Now, while NO-SHOWS is clued as [People who missed the boat, so to speak], regular solvers of Patrick's puzzles (CS and elsewhere) know that it is a rare Blindauer puzzle indeed that has no (Broadway) shows in it—and today is no exception. Yay! There's ["The Dance at the] GYM" [("West Side Story" song)]—though this is more like a musical scene than a song. And one of the very best in how much story it tells. Everything you need to know about the dynamics of the two gangs and the ill-starred trajectory of the two lovers is in there. There's also [Number in "A Chorus Line" that's actually a number] and that would be ONE. The link will take you—and I wouldn't lie about this—to some fully "staged" version of the song as it was performed on ice. In Germany (though it's not sung in German...). And finally there's [Twice, a musical about marriage] for I DO, I Do! The suggestion of nuptials is a nice tie-in, too, for FIANCÉE [Betrothed]. That, in turn, puts me in mind of bridal registries and wish-lists that include such items as silverware, linens, china and [Pricey stemware] CRYSTAL. Making use of the alphabet, a [Spelling contest] is a BEE (okay—not literally "the alphabet" here...), while the [Capital of Zaire?] is ZEE... That latter kind of clue is definitely fair game, so just be aware of it and the wordplay will fool you less as you do more puzzles (or that's the theory anyway!). As clues go, I also liked [First insurer to advertise on television] for AETNA. I had no idea and loved this tidbit. Ditto [Albrecht Mayer's instrument]. Having never heard of him, I've since learned that he's one of the most sought-after musicians in his field and he plays the OBOE. In fact, this principle oboist of the Berlin Philharmonic plays a Buffet Crampton Green Line Oboe. In case anyone asks you... I did figure that [Duffer's delight] would be golf-related and I was not disappointed. It's EAGLE, a score that's two below par—which would get any golfer doin' the happy dance, and not just a divot-makin' duffer! Busy morning—getting the kid off to school, going to the gym, and meeting up with a friend, not to mention assorted editing projects I ought to do. So, quickly: The theme is phrases that begin with commands to a dog, FIDO (SIT, STAY, COME, SHAKE). 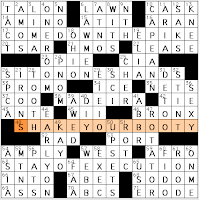 Aw, too bad the 15-letter FETCH A GOOD PRICE didn't find a space in this grid—probably would have entailed ditching the 14s, and I'm always pleased to have SHAKE YOUR BOOTY in the puzzle. For more, see my post at L.A. Crossword Confidential. 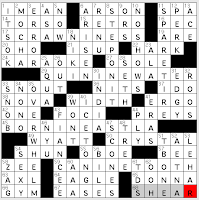 Brendan Quigley's blog crossword, "Game Time"
The theme centers on a hot new release today. You know what I'm talking about right? Ex-governor Rod Blagojevich's memoirs hit bookstores today! I know you've all pre-ordered your copies and will be reading it soon. No, really, it's the BEATLES ROCK BAND edition of the Rock Band video game, also brand NEW (62D: [Out today]). 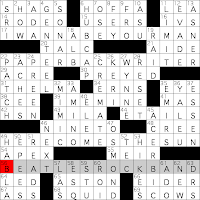 Knowing Brendan's musical predilections, it wasn't hard to guess where this theme was going with the help of the Down crossings—I solved it with the 1-Across clue (before I hid the rest of the Across clues) and all the Downs. I drew a blank on what could possibly fit in S*UID, and was thinking that EST (established) was the [Abbr. on a shingle]. ESQ! Lawyer's shingle! SQUID! Not STUID, not at all. I suspected that 11D [Hold in check] was a lousy two-word answer, and *EA and *VS could be a lotta things if you don't read those clues. LIMIT! 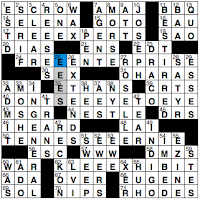 But hey, I had to work the crossword-solving lobe of my brain much harder than if I'd seen the Across clues, and when it comes to an easy puzzle, extra challenge can be welcome. The songs in the theme are clued by way of where they were performed, and apparently their levels in the video game are reflected by their positions in the grid. I haven't played Rock Band, so I don't know how all that works. The titles are I WANNA BE YOUR MAN, PAPERBACK WRITER, I ME MINE, and HERE COMES THE SUN. Rock-solid, timely and poppy theme today.